American Language Academy® (ALA) is pleased to announce our partnership with Belba Study and Travel Agency (BSTA) in Ulaanbaatar, Mongolia. On June 14, 2017, Yuni Nguyen, President (ALA) and Azjargal Batjargal, President (BSTA) signed an official memorandum agreement to solidify the partnership which will be in effect from June 14, 2017 through June 14, 2022. As part of this agreement, Belba Study and Travel Agency has become an official representative of American Language Academy in Mongolia. Belba Study and Travel Agency will assist American Language Academy recruit students into its campus in Greensboro, North Carolina, USA and online at ALA Sky Campus™. 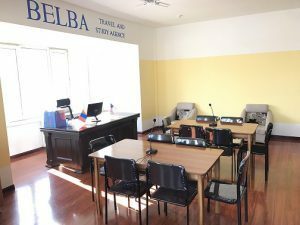 American Language Academy will operate an Administrative office at the Belba Study and Travel Agency which is located on Floor 8 of the 22A Building, in the Sukhbaatar District, 8th Khoroo, Ulaanbaatar, Mongolia 14200. At this office, prospective students will receive advising in the following areas: admissions, immigration, ALA programs and courses, pre-arrival information for students planning to come to the USA or attend classes online, information regarding ALA university/college partners and conditional letters of acceptance, and other information regarding enrollment and maintaining visa status at American Language Academy. Belba Study and Travel Agency assists students who seek to attend universities and colleges in the United States, with focus on visa consulting and travel assistance. For more information about this partnership, contact inquire@ala.edu.